I purchased a needle and dawes valve and have followed instructions from this forum on how to fit it. My needle valve works as I have played with the spool up rate. I have wound the dawes out to bring boost down and it does not appear to be doing that. I have boost going to 20psi at 3000rpm. No matter what I do this does not change. I have replaced the hoses, pulled the dawes apart to check that nothing had fallen into it but it does not matter. 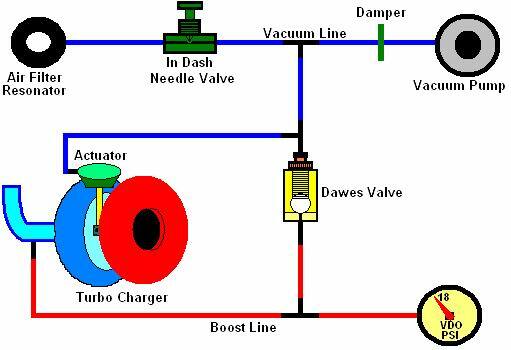 Please post a diagram how you plumbed in the Dawes valve with the needle valve or some photos of the installation. To me it sounds like the Dawes valve is incorrectly installed... The "T" end is where vacuum lines go and single end is where boost pressure comes in. Also what spring do you have in it? You can specify stronger spring which can take it past 19 psi but standard one will struggle over 16 psi. Is it possible that Dawes valve is incorrectly assembled too. The ball faces the boost side and the spring is the the adjusting end with the Tee. if you have access to compressed air with regulator you can test the valve opening pressures yourself. Is there a chance that boost signal is restricted (hose kinked/blocked etc) or outlet blocked? Thanks Rumcajs. Thanks for responding to me. I have followed Chaz Yellowfoot directions on the net.